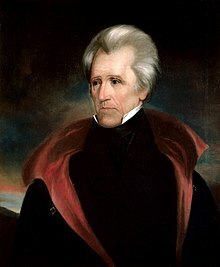 Andrew Jackson (15 March 1767 – 8 June 1845) was the seventh President of the United States of America (1829-1837), regarded as a hero for his actions in the Battle of New Orleans (1815), a founder of the Democratic Party, and the eponym of the era of Jacksonian democracy. He was the first American president to have been a Democrat. I know what I am fit for. I can command a body of men in a rough way, but I am not fit to be President. They must be either for or against us. Distrust them and you make them your enemies, place confidence in them, and you engage them by every dear and honorable tie to the interest of the country, who extends to them equal rights and privileges with white men. In New Orleans, Louisiana, 1814. As quoted in The Life of Andrew Jackson (1967), by John Spencer Bassett, Archon Books. p. 156-157. To troops who had abandoned their lines during the Battle of New Orleans (8 January 1815). As told to H.M. Brackenridge, Jackson's secretary, in 1821; quoted by James Parton, The Life of Andrew Jackson (1860), vol. II, ch. XXVI (Houghton Mifflin and Co., 1888), page 354. Parton cites his source as H.M. Brackenridge, Letters, page 8. As quoted by James Parton in the Life of Andrew Jackson (1860), vol. III, ch. XXXVI, "War Upon the Bank Renewed"
However, see also the mis-attributed quote "one man with courage makes a majority." As long as our government is administered for the good of the people, and is regulated by their will; as long as it secures to us the rights of person and of property, liberty of conscience, and of the press, it will be worth defending. First Inaugural Address (4 March 1829). The decision of the Supreme court has fell still born, and they find that it cannot coerce Georgia to yield to its mandate. Letter (7 April 1832) on the ruling in Worcester v. Georgia. Veto Mesage Regarding the Bank of the United States  (10 July 1832). Proclamation Regarding Nullification (10 December 1832). To say that any State may at pleasure secede from the Union, is to say that the United States are not a nation because it would be a solecism to contend that any part of a nation might dissolve its connection with the other parts, to their injury or ruin, without committing any offense. Secession, like any other revolutionary act, may be morally justified by the extremity of oppression; but to call it a constitutional right, is confounding the meaning of terms, and can only be done through gross error, or to deceive those who are willing to assert a right, but would pause before they made a revolution, or incur the penalties consequent upon a failure. While I concur with the Synod in the efficacy of prayer, and in the hope that our country may be preserved from the attacks of pestilence "and that the judgments now abroad in the earth may be sanctified to the nations," I am constrained to decline the designation of any period or mode as proper for the public manifestation of this reliance. I could not do otherwise without transcending the limits prescribed by the Constitution for the President and without feeling that I might in some degree disturb the security which religion nowadays enjoys in this country in its complete separation from the political concerns of the General Government. Hemans gallows ought to be the fate of all such ambitious men who would involve their country in civil wars, and all the evils in its train that they might reign & ride on its whirlwinds & direct the Storm — The free people of these United States have spoken, and consigned these wicked demagogues to their proper doom. Regarding the resolution of the Nullification Crisis, in a letter to Andrew I. Crawford (1 May 1833). This quote should be considered suspect there isn't any contemporary record. This - found evidence - contains the only mention of the quote. Message of Protest to the United States Senate (15 April 1834). Farewell Address, (4 March 1837), recalling what, by then, had reached the status of a proverb. Be good children, and we shall all meet in Heaven... I want to meet you all, white and black, in Heaven. Statement shortly before his death, as quoted in Life of Andrew Jackson (1860) by James Parton, p. 679. Oh, do not cry. Be good children, and we shall all meet in Heaven … I want to meet you all, white and black, in Heaven. Last recorded words, to his grand-children and his servants, as quoted in The National Preacher (1845) by Austin Dickinson, p. 192. Excellent Quotations for Home and School Selected for the use of Teachers and Pupils (1890) by Julia B. Hoitt, p. 218. As quoted in Many Thoughts of Many Minds: A Treasury of Quotations from the Literature of Every Land and Every Age (1896) edited by Louis Klopsch, p. 209. Sometimes reported as having been a retort to statements of his political rival, John Quincy Adams, who had boycotted Harvard University's awarding of a Doctorate of Laws degree to Jackson in 1833, declaring "I would not be present to witness her [Harvard's] disgrace in conferring her highest literary honors on a barbarian who could not write a sentence of grammar and could hardly spell his own name." Quoted in News Reporting and Writing 4th edition (1987) by M. Mencher. Unsourced variant: Never trust a man who has only one way to spell a word. Remark to an elderly gentleman who was sailing with Jackson down Chesapeake Bay in an old steamboat, and who exhibited a little fear. Life of Jackson (Parton). Vol. iii. p. 493. As quoted in The American Conflict (1865) by Horace Greely, as a reaction to the Supreme Court ruling in Worcester v. Georgia (1832); reported as a misattribution in Paul F. Boller, Jr., and John George, They Never Said It: A Book of Fake Quotes, Misquotes, & Misleading Attributions (1989), p. 53, noting that historian Robert V. Remini believes Jackson did not make this statement, though it summarizes his attitude, as evidenced in a statement similar in nature made in a letter to John Coffee: "the decision of the Supreme Court has fell still born, and they find that they cannot coerce Georgia to yield to its mandate." This is widely attributed to Jackson on the internet, but in research done for Wikiquote, no published source has been found. Similar remarks, "Corporations have neither bodies to be punished, nor souls to be condemned, they therefore do as they like." and "It has no soul to damn and no body to kick." have been attributed to Edward Thurlow, 1st Baron Thurlow (9 December 1731 – 12 September 1806). Some claim that Jackson said this on his deathbed. Some websites also claim that this is inscribed upon Jackson's tombstone. General Peyton C. March, as quoted in Crew Resource Management for the Fire Service (2004) by Randy Okray and Thomas Lubnau II, p. 25. Quoted as "a favorite maxim" of Thomas Jonathan "Stonewall" Jackson in Memoirs of Stonewall Jackson by His Widow, Mary Anna Jackson, Prentice Press/Courier Journal, 1895; ch. XIII p. 264 archive.org. Martin Luther, Von Kaufhandlung und Wucher, 1524, (Vol. XV, p. 302, of the Weimar edition of Luther's works). However, see also the attributed quote "desperate courage makes One a majority." Reported as a misattribution in Paul F. Boller, Jr., and John George, They Never Said It: A Book of Fake Quotes, Misquotes, & Misleading Attributions (1989), p. 54; Boller and George report that this was actually said by New York Senator William L. Marcy (January 1832). He told his friends that he purposed washing his hands utterly of public life and political affairs; that he had now been to all intents and purposes a public servant from the age of thirteen to that of threescore and ten … that he had lived his whole life in plain sight of the public and the people, hiding nothing, simulating nothing, confessing nothing, extenuating nothing and regretting nothing — except that he could never get a chance to shoot Clay or hang Calhoun. Augustus Ceaser Buell, who is considered a very unreliable historian, notorious for inventing quotes, in History of Andrew Jackson, pioneer, patriot, soldier, politician, president (1904), recounting comments by Jackson to William Allen, Thomas Benton, and Francis Blair at Blair's house, just days after leaving the presidency. 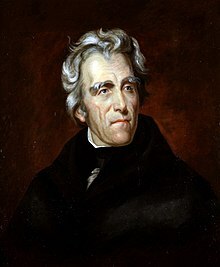 What is probably a paraphrase derived from this as if it were a direct quote of Jackson has appeared, without sources: "My only two regrets in life are that I did not hang Calhoun and shoot Clay". A charismatic figure, Jackson was combative, quick-tempered, and thin-skinned. To his friends he was generous, considerate, and above all loyal; to his enemies, mean-spirited and spiteful. "When Andrew Jackson hated," Robert V. Remini, a modern Jacksonian scholar, has written, "it often became grand passion. He could hate with a Biblical fury and would resort to petty and vindictive acts to nurture his hatred and keep it bright and strong and ferocious." He at time exploded with anger, but it is believed that he never really lost his temper. Rather, he launched into tirades quite purposefully either to intimidate his opposition or to end debate on a matter that was dragging on too long. Martin Van Buren, his closest adviser, marveled at Jackson's ability to turn his anger on and off at will. One minute he could be shrieking at the cabinet in the high register his voice invariably had whenever he was agitated; the next moment, alone with Van Buren after the others had left, he was relaxed and in good humor. At social occasions Jackson surprised many with his grace, poise, and charm. Around women he shed his backwoods manner and earthly language to engage comfortably in social discourse. He delighted in disappointing those who, he said, "were prepared to see me with a tomahawk in one hand and a scalping knife in the other." 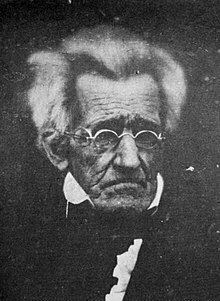 Andrew Jackson then is a sturdy obstacle to the Democrats' ongoing and increasingly frenzied campaign to erase from America's history all the unsavory things their party has championed for most of its existence, namely, slavery, secession, civil war, segregation, socialism, and, most recently the slaughter of infants. And so their longtime hero Andrew Jackson has been, as Sam Spade once said, chosen to take the fall alongside the battle flag of the Army of Northern Virginia to help erase the Democrats' consistently reprehensible behavior and policies from the history books. General Jackson, on his death-bed, said, pointing to the Bible: "That book, sir, is the rock on which our Republic rests—the bulwark of our free institutions." "Constitution—Its Amendment" in The Reformed Presbyterian and Covenanter, Volume 2 No. 11 (November 1864), p. 321. This is the earliest occurrence yet located of this anecdote. Other early citations (with various wordings) include B. F. Morris, Christian Life and Character of the Civil Institutions of the United States (Philadelphia, 1864), p. 191; Rev. Dr. Luther T. Townsend of Boston University, in an address at the "Anniversary of the Freedman's Aid Society" as recorded in the Third Annual Report of the Freedmen's Aid Society of the Methodist Episcopal Church (1868), p. 77. A colored battalion was organized for the defense of New Orleans, and General Jackson publicly thanked them for their courage and conduct. In 1836, Americans living in Texas- then a province of Mexico- declared an independent republic and almost immediately sought to join the Union. Andrew Jackson had championed the acquisition of Texas, but Van Buren was far less enthusiastic, knowing that the arrival of this much potential slave territory would inflame the North. After becoming president, he delayed full recognition for months, and then delayed Texan demands for annexation as well. 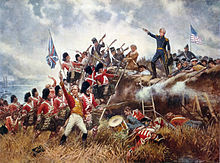 Both sides were angry- John Quincy Adams saw in Van Buren little more than Jackson's expansionism "covered with a new coat of varnish," while Southerners denounced Van Buren for his timidity. Jackson wrote edgy letters to his successor, demanding stronger action and crossing well beyond the bounds of postpresidential propriety. Van Buren offered more satisfaction to the South as he pursued a different Jacksonian legacy. Throughout his presidency he continued the brutal Indian removals that had freed up vast quantities of land in Jackson's Southwest. Thousands of Cherokees were forced to march along the "Trail of Tears" from Georgia to Oklahoma, and the Seminoles in Florida were violently hunted down (their leader Osceola was tricked into capture with a false flag of truce). Van Buren dwelt in the lying pieties of the day when he reported to Congress that the government's treatment of the Indians had been "directed by the best feelings of humanity." One of his favorite nieces, an insubordinate teenager, told him she hoped he lost the election because of what he and Jackson had done to the natives. This page was last edited on 1 March 2019, at 17:14.